Disclosure Announcement for World Leaders Source: Sirius DisclosureThe following DRAFT speech was written by Dr. Greer when requested by two separate points of contact to President Trump and President Putin. The two contacts do not know each other but both requests were made over a few weeks in the Spring of 2018.Dr. Greer wrote this speech as a DRAFT template that could be adapted by any world leader to announce that we are not alone in the Universe and have had contact with extraterrestrial civilizations.You may forward this speech to leaders in your own country, and resend and request that President Trump and President Putin collaborate on such an announcement in coordination with the UN and other world leaders in China, the EU and elsewhere.Thank you!Feel free to download a PDF version of this speech HERE. My fellow Americans/ My fellow Russians/ And all the citizens of earth:It has come to our attention that Extraterrestrial civilizations of great technological advancement have been visiting the earth for some time.While their presence likely dates from very ancient times, the modern era since WW II has seen a large increase in sightings and interactions with these advanced life forms and their spacecraft.It must be emphasized that they appear to pose no threat to humanity or earth, but instead are quite concerned about our own unchecked war ~ making capabilities and violence, combined with our early attempts at the exploration of space.Since the dawn of the nuclear era, these extraterrestrial civilizations have made concerted efforts to do reconnaissance at all known space and nuclear facilities. In some cases these facilities have been penetrated by ET craft and our nuclear missiles rendered inoperable. Such incursions appear designed to warn us not to use these world-destroying nuclear weapons and are not acts of hostility.They also appear concerned with the rapid decay of our biosphere and environment and the extinction of many species on earth.Since World War II there have been extremely secretive programs studying the energy , communication and propulsion systems of these ET spacecraft.It is time for us to disclose these momentous scientific findings to you.These technologies have the potential, if used only for peaceful purposes, to give us a new and sustainable civilization on earth, free of poverty and pollution within a generation.However, if used for destructive and violent purposes these same technologies could end our civilization.For this and other reasons the strictest secrecy has surrounded the study of these extraterrestrial technologies. But the time has arrived for the truth to be known: we are not alone in the universe. And it is time for humanity to become a mature, peaceful civilization and take its place in the cosmos with other advanced peoples from other star systems.To this end, I call on the world community, other world leaders and all the people of earth to come together and begin this new era on earth.We must make open, peaceful contact and initiate diplomatic ties to these other worlds. We must do this as children of earth and not just one nation. 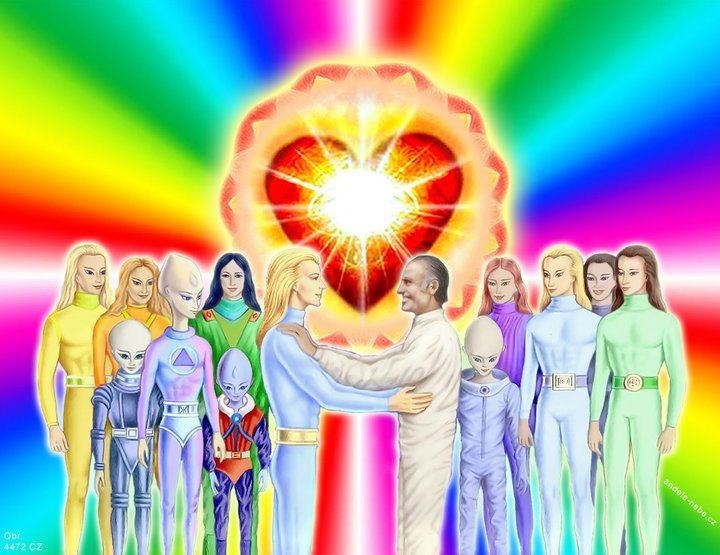 All nations and people of earth must be represented and empowered in this process.We must commit to keeping all weapons out of space and going only into space for peaceful purposes that benefit all of humanity.We must bring forth these advanced energy and propulsion technologies so that the world’s environment and people benefit. We must all agree to never allow these new technologies to be used as weapons of war.And we must commit amongst ourselves that if any nation or group attempts to use these technologies for violent or destructive purposes, every nation and people on earth will rise up to immediately stop it.We face a choice: If we do nothing, our environment and civilization will degrade and we may face extinction. If we use this new knowledge and science for war and destruction we will also surely perish.But if we establish a world of peace, humanity can now advance as a civilization that is sustainable, just and worthy of exploring the universe.This is the singular and great challenge of our generation: to establish world peace, and to create a new sustainable civilization. Once we have achieved this foundation of peace and justice, we have learned that these other worlds will welcome us in the cosmos with open arms and hearts.So, my fellow citizens of earth, let us work together to achieve the destiny of humanity: An enlightened, peaceful world that joins her place among the other people of the cosmos.For this is the only possible good future for humanity. It is time for us to unite as a people and create that good future – NOW.